Russian police said the driver in the crash has been detained. Moscow’s traffic monitoring agency said the driver claimed the crash wasn’t premeditated. 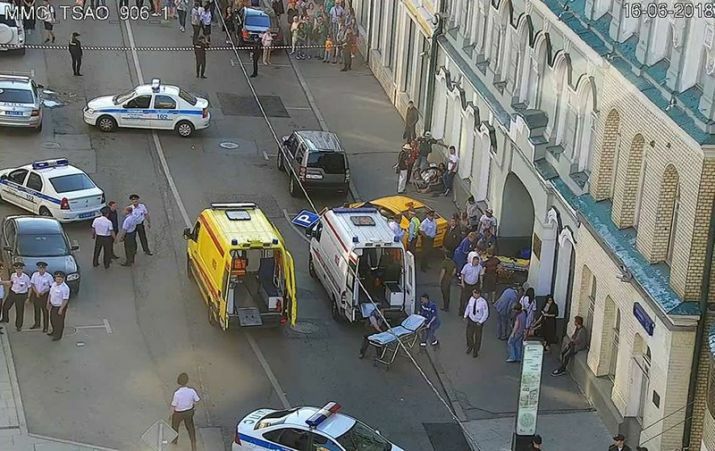 Moscow: Eight people, including two from Mexico, were injured Saturday when a taxi crashed into pedestrians on a sidewalk near Red Square in Moscow. Video circulating on Russian social media and some news websites showed the taxi approaching a stopped line of cars, then veering onto the sidewalk and striking pedestrians. It then hit a traffic sign and bystanders tried to wrestle the driver out of the taxi, but he broke their grip and ran away; it was not clear how he was finally detained. The source of the video wasn’t specified, but it appeared to be a handheld recording of footage from a video monitor. Russia is hosting the World Cup and the capital’s streets have been crowded with foreign visitors. The accident took place on Ilinka Street, about 200 meters (650 feet) from Red Square and Moscow’s famous GUM shopping arcade, an area popular with tourists. The city health department said seven of the injured were in satisfactory condition and one was in more serious condition. Specifics on their injuries were not available. The agency that monitors Moscow’s traffic safety said the driver is a citizen of the former Soviet republic of Kyrgyzstan who told police that the crash was not intentional. Mexico’s embassy in Moscow said two of its citizens were among the injured. Mexico is to play against Germany on Sunday in Moscow, one of 11 host cities for the tournament.